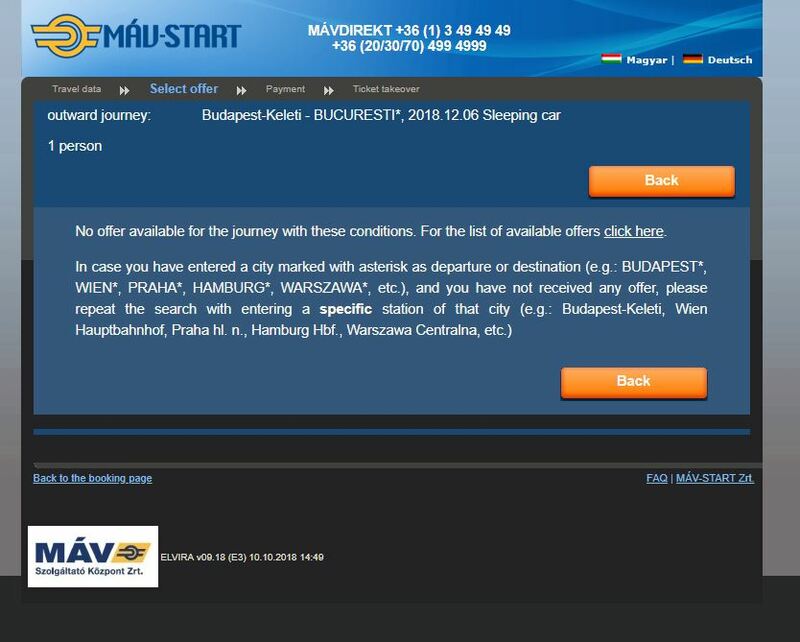 I am looking to book a ticket from Budapest to Bucharest on board the 473 Ister train operated by Hungarian railway (https://www.mavcsoport.hu/en) departing Dec 6th 2018. The website mentions that bookings open 90 days in advance but it does not list any tickets for Dec 6th (the last date for which tickets are available are Dec 5th). 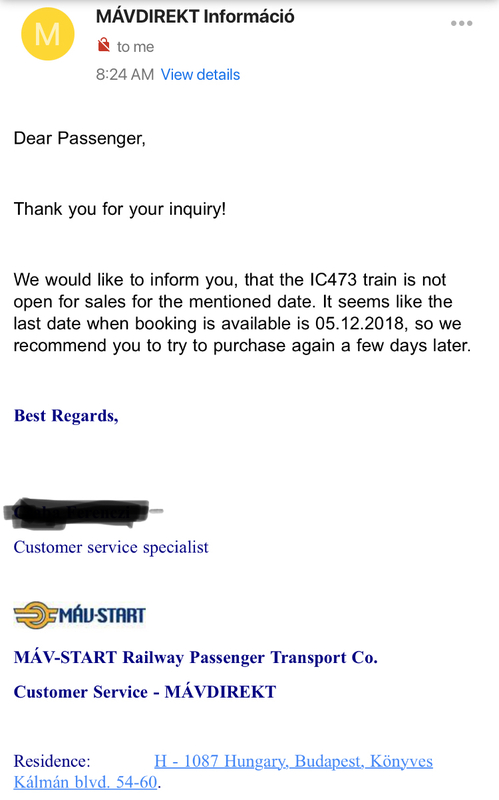 I have sent an email to Hungarian Railway asking them the cause and an automated reply that I got back said it takes anywhere from 1-3 months for them to get back. I was wondering if any experts can help here. I understand European timetable changes on Dec 8th. But Dec 6th should still be listed. As of now (5 October 2018) tickets on this route are available until 8 December 2018. In response to your comment, about not being able to book the ticket. 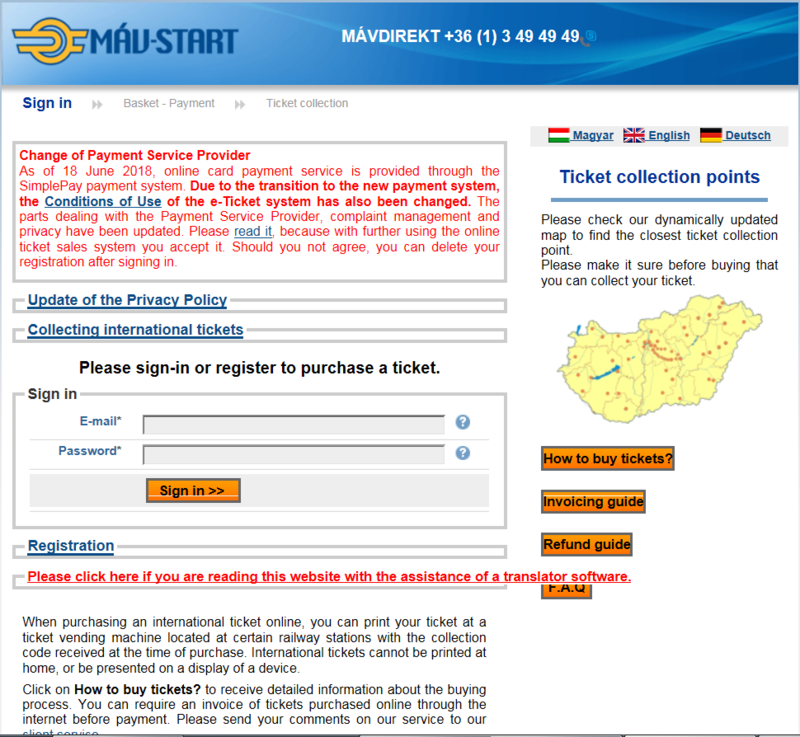 I think that MÁV could invest some time in training their web page developers with some user experience improvement. 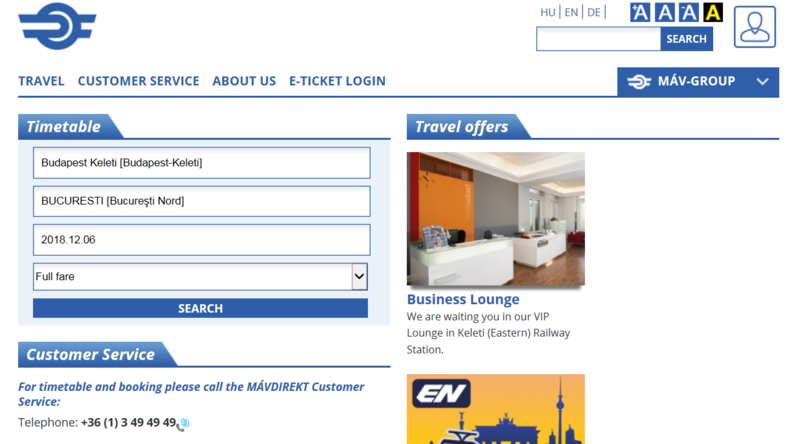 Select "Budapest Keleti [Budapest-Keleti]" as your departure station. Select "BUCURESTI [Bucureşti Nord]" as your destination station. Choose your date of travel. Click the "Search" button. Make the choices about how you want to travel and then enter your date of birth (make sure you use the format yyyy.mm.dd, including leading zeros if necessary). NB: I could not do this in Google Chrome and I am using an older version of IE. Click the button "Tickets and Prices". Click the tiny down arrow next to "Further Information"
Click in the radio button in your train's line. You now need to create a login for MÁV. Click on the "Registration" link and fill in your details, then sign in and pay. 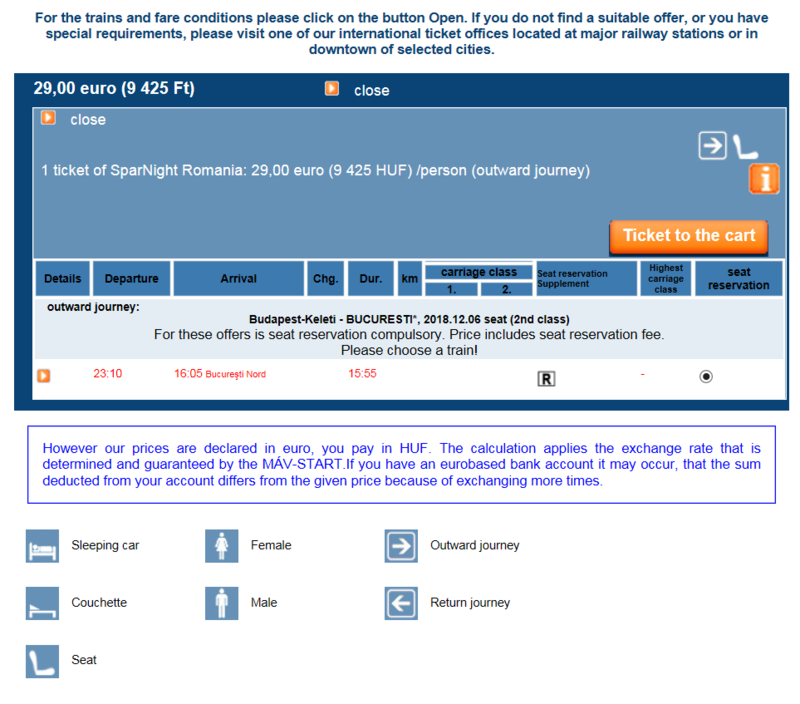 I tried to book the Romanian part of the journey on the CFR web site (they do not offer international connections there) and Romanian railway tickets can obviously only be booked 60 days in advance. 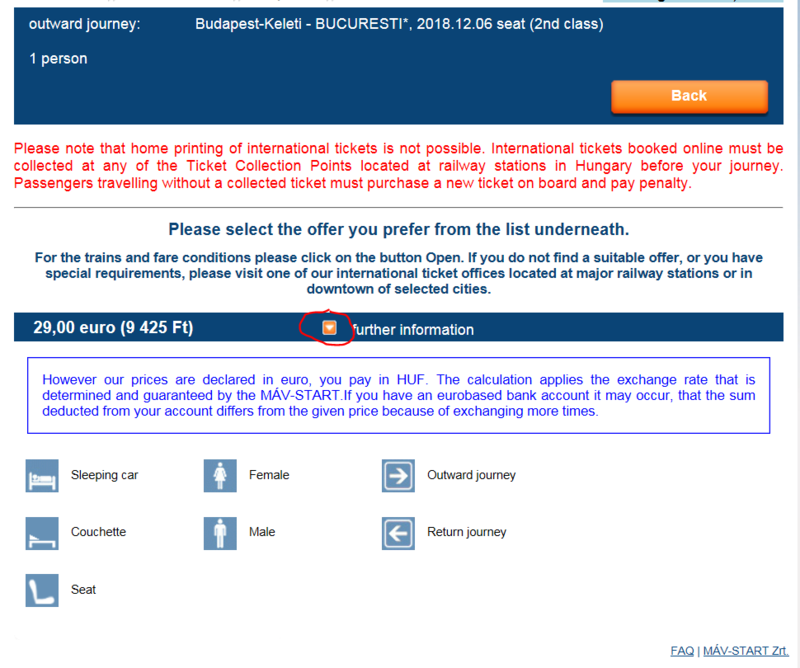 Even if Hungarian railways generally sell tickets 90 days in advance, they are for international tickets likely bound by a combination of the restrictions of all participating trains operators. I would simply wait a few more days and assume that tickets for the 6th of December will be made available for booking soon. The following is the reply I received from Hungarian Railways. So guess I should wait for a few days/weeks before I try again. Not the answer you're looking for? Browse other questions tagged trains europe romania hungary or ask your own question. Is there a direct train from Bucharest to Istanbul? 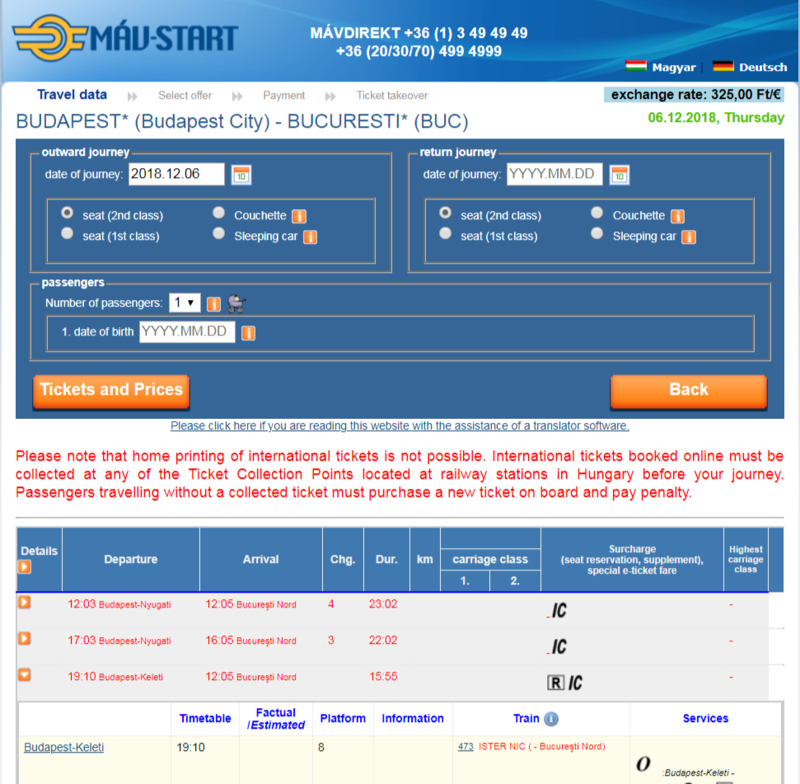 Train from Budapest to Zagreb - buy in advance or at the train station? 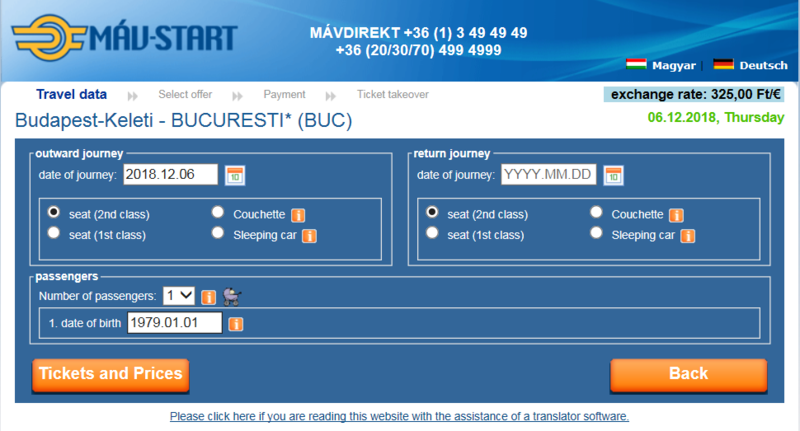 Buying train ticket from Bucharest to Constanța online? How far in advance before journey date can train tickets in Myanmar be bought? How far in advance do tickets on Czech Railways become available near the yearly timetable change?